SELECOM once again demonstrates its ability to listen and to innovate to design products that meet the needs of its customers in the rapidly changing mobile phone technology. With the advent of LTE, appeared MIMO technology (Multiple Input, Multiple Output), which is one of the innovations to obtain high flow rates. 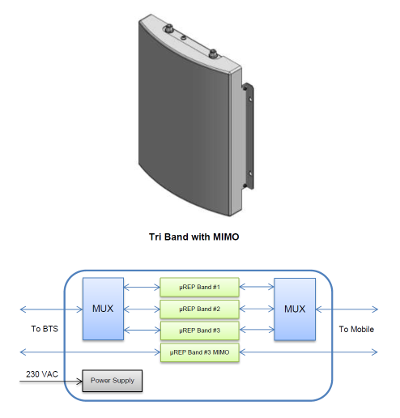 To allow clients to retain the benefit of MIMO SELECOM designed a micro-repeater range capable of handling 2 MIMO channels in a single device. Equipped with 2 receive antennas and two transmit antennas (1 broadband, 1 narrowband for the MIMO channel), the micro-repeater μREP of SELECOM can be divided into single-band, dual-band and tri-band, with the MIMO channel in the operator's frequency.